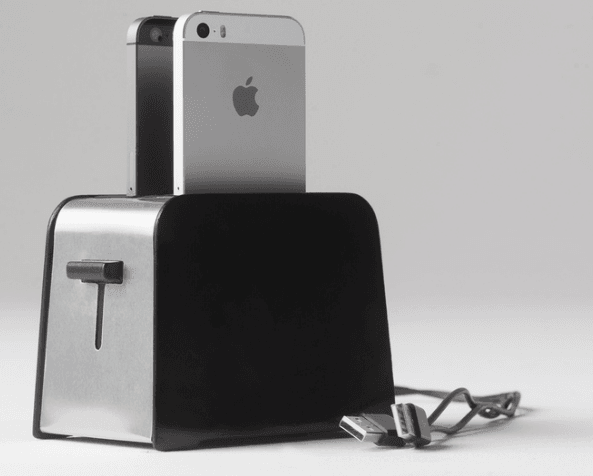 The Foaster is latest innovative wireless charging dock for iPhone which is designed to charge your iPhone 5 like a toaster and keeps counters free of cable clutter. This cool product is the perfect charging station or charging dock that would looks great in your Home – kitchen counter especially for the person lives in a home with multiple iPhones (iPhone5, 5s and 5c). It looks exactly like a toaster where you can place two iPhones at once to charge. The Foaster charger only supports the iPhone 5, iPhone 5C and iPhone 5S series with built-in lighting connectors. It has a clean plastic and minimalist design that works fast and efficiently with each iPhone in place. The slot to insert the iphone is also large enough for them to fit with a rubber case. 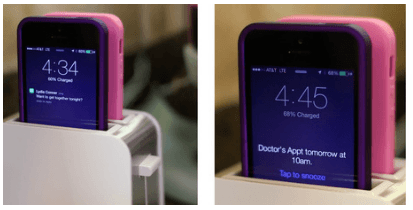 You don’t have to take your phone case off for fast charging. While your iphone is charging, you can also receive and view any alerts for call/text/IMs that won’t interfere with the process as Foaster is designed around the fact that we want to be able to see our phone, and never miss a message- even while it’s charging. The depth of foaster’s docks allow you to see incoming texts, reminders, and alerts as they come in. The Foaster Toaster would be an excellent addition to your wireless phone chargers, It is currently looking for Kickstarter pledges to help it become an actual product. If you think having a toaster iPhone charger is something you need in your life, a $79 pledge will get you one, as long as they’re able to reach their $40,000 goal. Karbonn Titanium X vs Micromax Canvas Turbo: Which one’s a better phablet? i think it is a great idea. Btw how much does this cost? Where can I buy this ????? ?